Pools are great fun for the whole family. But the enjoyment of swimming during the heat of summer can be overshadowed by the safety risks. The potential dangers of deep water, slippery decks or cement, and little ones falling in creates a headache for any pool owner. Combine this with the frustration and hard work of daily pool maintenance and you may be on your way to wishing you never had a pool in the first place! Installing an automatic pool cover will let you rest easy knowing your pool water is not only clean and warm, but safe for children and household pets. 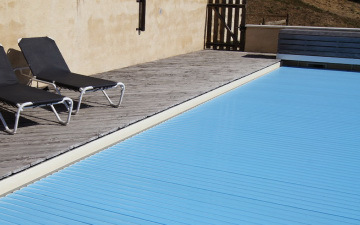 An automatic pool cover is made from heavy duty, UV resistant, interlocking slats. These allow automatic pool covers to easily withstand several people walking on them. This unique, impermeable design makes them almost effortless to use, and retain more heat than any other kind of pool cover, which, makes your water warmer. Unlike covers that must be installed by hand or with the help of a pool reel, with a turn of a key you can extend an auto cover over your pool, creating a protective barrier in minutes. Automatic pool covers run along a set of parallel tracks mounted above or below the deck of your pool. Control Your Pool Cover with a Mobile App! More recently, mobile applications have been released which allow pool owners to operate their cover with their mobile phone, making them even more user friendly. Though suited best for standard rectangular pools, automatic covers can nonetheless fit over any pool shape, as long as the tracks run parallel to each other. In addition to the high quality materials, guaranteed safety, and ease of use, automatic covers are also the most visually appealing option available. Most companies offer a variety of colors, allowing owners to choose a cover based on both the practical benefits, and their personal aesthetic tastes. With all of this in mind, it’s easy to see why automatic covers range from $3,000-$10,000, making them the costliest covers on the market. 1. Safety: You can’t always be there to watch your loved ones. For owners with children or pets, the cost of a pool cover is a small price to pay for safety. 2. Cost: Over time, the money saved on heating and cleaning costs can eventually surpass the initial cost of the pool cover. *Annual cleaning, chemical treatments, and heating costs range from $499-1540. The use of a pool blanket can cut these expenses by up to 75%. 3. Convenience: Automatic covers seal out dirt and debris, keeping pool water crystal clear and very low maintenance. *Most pool-owners report a reduction of daily and weekly maintenance time by up to 75%, minimizing the need for busy owners to hire a pool cleaning service. Currently all pool owners are required by law to install a fence with a lockable gate, intended to prevent accidents. But a gate left unlocked or a broken lock presents as much danger as a pool with no fence. Automatic pool covers are proven to reduce the risk of accidental drowning, and significantly lower the cost of pool maintenance. These well-crafted covers keep debris out, seal solar and artificially produced heat in, reduce your pool maintenance costs and most importantly, protect your loved ones from danger.